Children learn to SPEND SPEND SPEND !!! As they get older, they spend more. Guess what happens when they are a teenager ... most parents eventually say "when you get a job, you can spend your own money". Guess what happens when they get a job ... they spend it. Guess what happens when they get a pay rise ... they spend it. A year ago I've read a story about a Rockefeller family. Interesting. You'd expect that these kids, raised in the lap of luxury, wouldn't need to learn these things. Yet Rockefeller wanted his kids to understand and value money. From the book by Robert Allen "Multiple Streams Of Income"
That story inspired me to teach my son about money. Our school systems do not provide any financial education to a children. I decided to a build a software that will help my son to learn about income, saving, spending, charity. 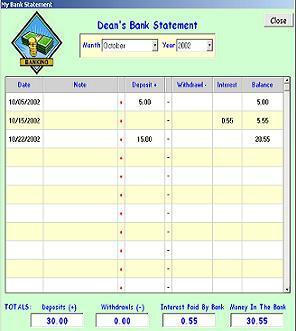 By that time I already built a software for myself to organize and control my money - My Budget Planner. My Budget Planner For Teens (Ages 10 -18) software. The software will ask your child to put some money into the savings and some money into the charity every time when your child earn money or receive it as a gift. 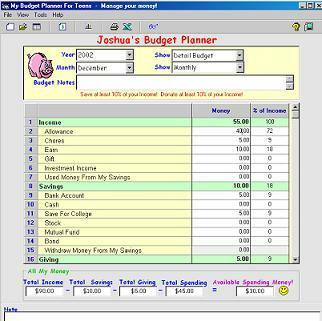 If you have 2, 3, 4 or more children you can use the same software and create a separate Budget Planner for every child. You can start using My Budget Planner For Kids or My Budget Planner For Teens right now by downloading it online by order a CD by mail. You can pay by credit card, check or money order. There is no risk to you at all. If you not satisfied, I will return your money and you will keep the software. That is how confident I am that this product will work for you! Order and Download Online now! Copyright 2002 T.Shevchuk, All rights reserved.